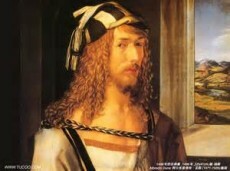 German Renaissance artist Albrecht Durer was born May 21, 1471, in Nurnberg. In 1494 he traveled to Italy, where he remained until 1495. The trip had a strong effect on Durer; echoes of Italian art are apparent in most of his drawings, paintings, and graphics of the following decade. Italian influences were slower to take hold in his graphics than in his drawings and paintings. He died in 1528. Albrecht Durer was regarded as the greatest German Renaissance artist. His work includes altarpieces, portraits and self-portraits, engravings, and woodcuts.